This 2019 Mercedes-Benz AMG® GT AMG® GT 53 is proudly offered by Mercedes-Benz of Temecula This Mercedes-Benz includes: DESIGNO BLACK DINAMICA HEADLINER 115V SOCKET ARRAY(0x15678730) Heated Steering Wheel Heated Front Seat(s) 3-ZONE CLIMATE CONTROL Multi-Zone A/C A/C Rear A/C ARRAY(0x15678448) Lane Departure Warning Lane Keeping Assist Adaptive Cruise Control Blind Spot Monitor Telematics HEATED & VENTILATED FRONT SEATS Cooled Front Seat(s) Heated Front Seat(s) ARRAY(0x156786b8) Back-Up Camera ACTIVE MULTICONTOUR FRONT SEATS W/MASSAGE FUNCTION Seat-Massage Split Bench Seat Power Passenger Seat Power Driver Seat Fixed Bench Seat Bucket Seats AMG® PERFORMANCE EXHAUST SYSTEM AMG® ILLUMINATED DOOR SILLS HEAD-UP DISPLAY W/AMG®-SPECIFIC CONTENT Heads-Up Display NATURAL GRAIN BROWN ASH WOOD TRIM Woodgrain Interior Trim *Note - For third party subscriptions or services, please contact the dealer for more information. * Pull up in the vehicle and the valet will want to parked on the front row. This Mercedes-Benz AMG® GT is the vehicle others dream to own. Don't miss your chance to make it your new ride. Once you see this Mercedes-Benz, you'll quickly see that this is the perfect vehicle for the outdoor junky! You'll even feel relaxed knowing that this All-Wheel drive vehicle will get you to where you are going no matter what may come your way. Also, with this Mercedes-Benz AMG® GT's dependable control you'll be able to drive into the sunset without a care in the world! The Mercedes-Benz AMG® GT AMG® GT 53 will provide you with everything you have always wanted in a car -- Quality, Reliability, and Character. This 2019 Mercedes-Benz AMG® GT AMG® GT 63 4 Door is proudly offered by Mercedes-Benz of Temecula This Mercedes-Benz includes: 115V SOCKET ACTIVE MULTICONTOUR FRONT SEATS W/MASSAGE FUNCTION Seat-Massage Split Bench Seat Power Passenger Seat Power Driver Seat Fixed Bench Seat Bucket Seats ARRAY(0x55f5abaa8fa8) ARRAY(0x55f5aba00ff0) ARRAY(0x55f575ccf6a0) Lane Departure Warning Lane Keeping Assist Adaptive Cruise Control Blind Spot Monitor Telematics 3-ZONE CLIMATE CONTROL Multi-Zone A/C A/C Rear A/C ARRAY(0x55f57a02cae0) Chrome Wheels Tires - Front Performance Aluminum Wheels Steel Wheels Tires - Rear Performance ARRAY(0x55f5978cf510) Heated Steering Wheel Heated Front Seat(s) ARRAY(0x55f5aba8fae8) HEAD-UP DISPLAY W/AMG®-SPECIFIC CONTENT Heads-Up Display ARRAY(0x55f566a826d8) Back-Up Camera RED SEATBELTS DESIGNO BLACK DINAMICA HEADLINER EXTREME PERFORMANCE SPORT TIRES Tires - Front All-Season Tires - Front Performance Tires - Rear Performance Tires - Rear All-Season AMG® CARBON FIBER TRIM AMG® PERFORMANCE EXHAUST SYSTEM *Note - For third party subscriptions or services, please contact the dealer for more information. * Pull up in the vehicle and the valet will want to parked on the front row. This Mercedes-Benz AMG® GT is the vehicle others dream to own. Don't miss your chance to make it your new ride. Enjoy the comfort and safety of this AWD Mercedes-Benz AMG® GT AMG® GT 63 equipped with many standard features found on other vehicles as optional equipment. The Mercedes-Benz AMG® GT AMG® GT 63 will provide you with everything you have always wanted in a car -- Quality, Reliability, and Character. Contact Mercedes-Benz of Temecula today for information on dozens of vehicles like this 2019 Mercedes-Benz AMG® GT AMG® GT 63. This Mercedes-Benz includes: AMG® PERFORMANCE DINAMICA/CARBON FIBER STEERING WHL SOFT-CLOSE DOORS 115V SOCKET ENERGIZING COMFORT PACKAGE AMG® NIGHT PACKAGE DRIVER ASSISTANCE PACKAGE Lane Departure Warning Lane Keeping Assist Adaptive Cruise Control Blind Spot Monitor Telematics 3-ZONE CLIMATE CONTROL Multi-Zone A/C A/C Rear A/C WHEELS: 21 AMG® FORGED CROSS-SPOKE W/GREY ACCENTS Chrome Wheels Tires - Front Performance Aluminum Wheels Steel Wheels Tires - Rear Performance HEATED REAR SEATS Heated Rear Seat(s) PARKING ASSISTANCE PACKAGE Back-Up Camera RED SEATBELTS DESIGNO BLACK DINAMICA HEADLINER AMG® CARBON FIBER TRIM AMG® PERFORMANCE EXHAUST SYSTEM BURMESTER HIGH-END 3D SURROUND SOUND SYSTEM Premium Sound System *Note - For third party subscriptions or services, please contact the dealer for more information. * Pull up in the vehicle and the valet will want to parked on the front row. This Mercedes-Benz AMG® GT is the vehicle others dream to own. Don't miss your chance to make it your new ride. This AWD-equipped vehicle will handle beautifully on any terrain and in any weather condition your may find yourself in. 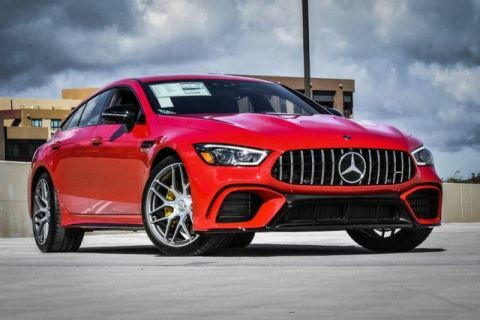 The benefits of driving an all wheel drive vehicle, such as this Mercedes-Benz AMG® GT AMG® GT 63, include superior acceleration, improved steering, and increased traction and stability. You could keep looking, but why? You've found the perfect vehicle right here.